How might humans repopulate the planet if no more babies were being born? Why, clones, of course! 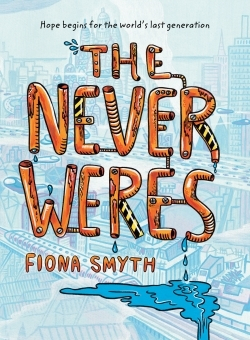 But, according to Fiona Smyth’s dystopian graphic novel, The Never Weres, there’s a glitch. The clones are not the thinking, creative, emotional creatures they need to be to provide the human race with enduring offspring. Instead they’re blank and mechanical, more like dolls than people, and they die off fairly quickly. Protesters line the dreary city streets carrying signs that read “Keep Your Hands off My DNA” and scientists worry that the teenage population will be the last generation. On the fringe of the societal turmoil, Jesse, Mia, and Xian go about their average teenage day. They pass notes in class, eat lunch together, and navigate fraught parental relationships. Xian has an adventurous streak that leads her into abandoned tunnels below the city where she finds equipment that looks suspiciously like that used in cloning labs. The mystery deepens when Mia is given a map drawn by her elderly friend Mrs. C.—a map that corresponds to the paths Xian wanders under the streets. Together with Jesse, whose mother is one of the scientists trying to save the human race through cloning, the friends struggle to put the pieces of the decades-old puzzle together while running from a suspicious government agent and his determined bots. While Smyth’s version of the future is undeniably gritty, there’s also a certain clever beauty embedded in the details of the street—people wear face masks, rice is priced at $50 a bag, protest graffiti decorates every wall, and names common to our present—Scott Pilgrim, Justin Bieber—appear like inside jokes. References to cultural icons like Frida Kahlo help readers identify with the futuristic scenery and reveal the magnitude of what these characters are losing—everything. Smyth, an award-winning Canadian artist, effectively combines artwork and language to make her readers care about the characters. Some scenes are heavily detailed and revealing while other pages feature a single symbol; the dichotomy keeps readers engaged and guessing. Her characters have rich inner lives that surface through bizarre, foreshadowing imagery, like Mrs. C.’s hallucination of being washed away. Smyth combines mystery, supernatural elements, and realistic human relationships to produce a magnified slice of what the future may hold. Both teens and adult readers will find her graphic novel riveting.